Identify the significance of selecting structural systems for multifamily housing buildings in regards to fire safety, cost, and comfort. 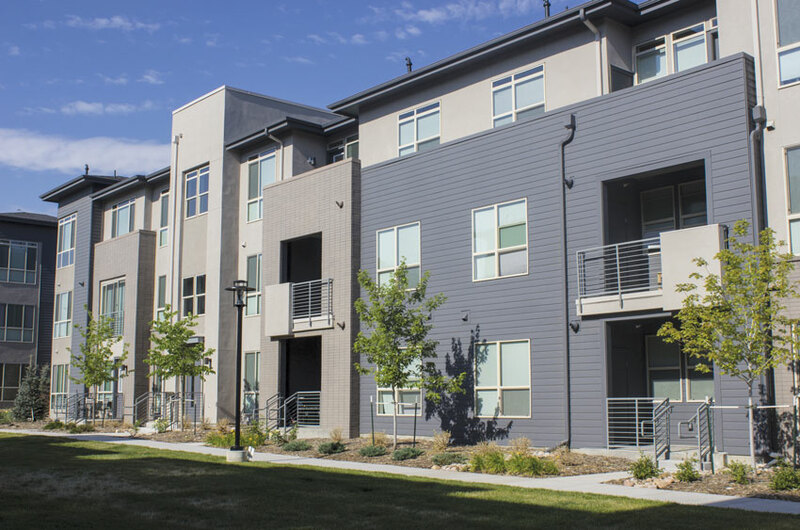 Assess the choices in exterior cladding to create multifamily buildings that have well-designed facades while assuring durability and cost effectiveness. Explain the importance of proper fenestration choices, particularly when using window wall designs in multifamily housing. According to data from the federal government, the number and type of multifamily projects completed annually has changed between 2012 and 2016. The Survey of Market Absorption of New Multifamily Units (SOMA), sponsored by the Department of Housing and Urban Development (HUD), is a free and regularly updated reporting source that uses the U.S. Census Bureau’s Survey of Construction (SOC) as its sampling base. Each month, a sample of residential buildings containing five or more units is selected for SOMA. 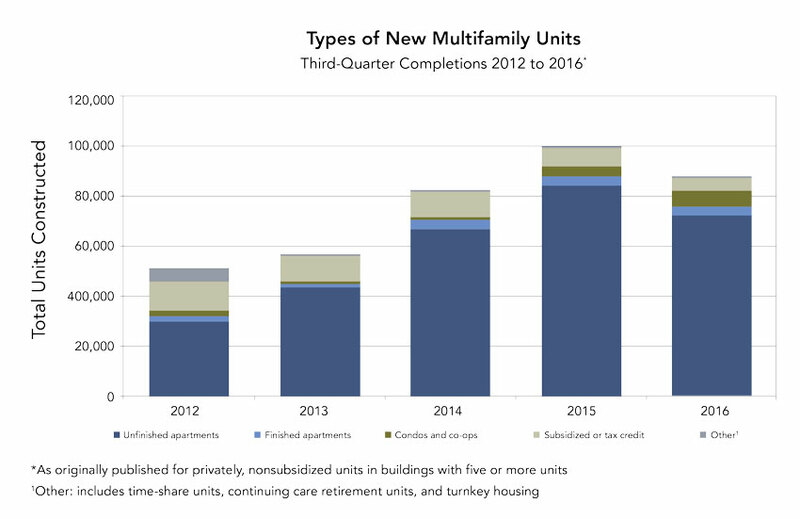 Its data for the years 2012 through 2015 shows that the number of completed multifamily housing units increased notably in each of those years. In 2016, the total number dipped a bit lower than 2015 but was still higher than all of the years between 2012 and 2014. During this same time period, the mix of different types of multifamily housing also showed notable changes each year, particularly with fewer subsidized or tax-credit units being constructed. Multifamily housing continues to be a strong market, but incorporating more luxury features while still controlling costs creates design challenges, and opportunities, for architects. The SOMA is based on an initial three-month interview that collects information on amenities, rent or sales price levels, number of units, and type of building, including senior housing. It also tracks the number of units taken off the market (i.e., absorbed) by virtue of being rented or otherwise occupied. Hence, it can track the rate of absorption of new apartments as an indicator of supply and demand of multifamily housing in areas around the United States. Reports of this data for the entire country are broken down for specific metropolitan areas, published quarterly, and released on the Internet (www.census.gov/housing/soma). The latest data is generally available in early March, June, September, and December. There are also two annual online publications, the H-130 Annual, which provides 12-month absorption data for the previous year and is released the first week April, and the H-131 Characteristics of Apartments Report, which provides annual three-month absorption rates, released the first week of July. In reviewing the annual data between 2012 and 2016, it is clear that there are regular cycles of units becoming available and being absorbed. While the general numbers may be up, the rate of absorption appears to have slowed such that more units are still available 90 days after first coming on the market than previously. 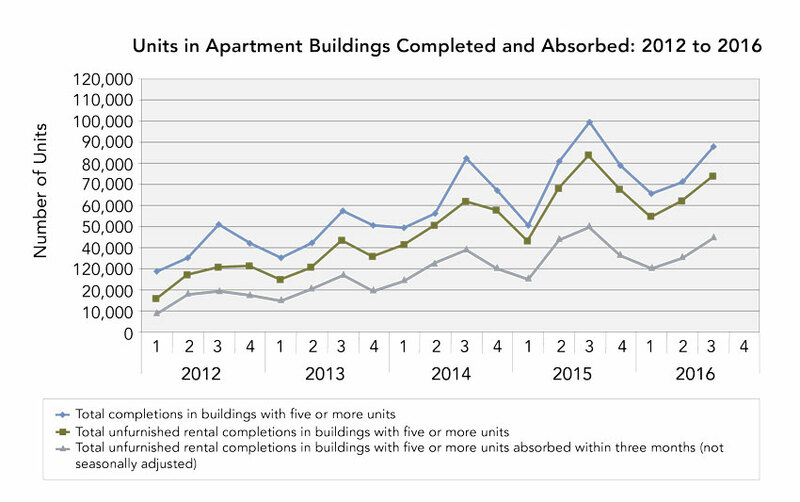 The U.S. Census Bureau tracks the construction of multifamily units by type and by total number of units completed. The trends observed from this SOMA data suggest a few things. While the current number of new units may be slowing a bit to let the absorption rate catch up, the market overall is still strong. The availability of units also suggests that competition is strong, meaning that owners and developers are looking for ways to differentiate themselves from other available options in any given market. That is evident in the many projects that offer more attractive designs and luxury options to lure new residents, all while keeping costs under control, of course. The absorption rate of multifamily housing units is tracked by the U.S. Census Bureau as a means to determine market conditions on a local and national basis. With all of the above in mind, we will look at five different but significant architectural building systems related to the design and construction of multifamily housing. Each one will be examined based on the ways it can be used to provide better design, control construction costs, and provide residents with an attractive, comfortable, and desirable housing option. Every multistory project brings unique structural design challenges, and that is quite true for multifamily buildings too. 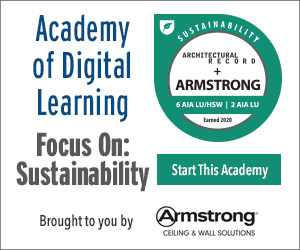 Yet they all share the need to balance architectural design intent with cost-effective construction systems. Visual issues come into play by deciding to use a building system that is either covered over or is left exposed as part of the design aesthetic. Space planning and optimization can be impacted directly based on the cost-effective spans of structural systems that can limit locations of structural walls and columns. Cost control is always on the mind of the building owners or developers, meaning that they need to rely on the design team to justify the structural system in terms of cost effectiveness when compared to other systems. Clearly, the structural system, architectural design, and overall cost are all intertwined and related to each other. The ideal situation is to select a system that allows for structural synergies and economies of construction to enhance the architectural design. The common structural systems used in multistory construction are based on either concrete or steel, a combination of the two, or even combinations with wood in some cases. The selection is typically determined by the specific criteria and needs of a given project not only for structural strength but also for fire safety, sound separation, and coordination with other building systems and finishes. One approach that seems to meet all of these needs fairly economically is a “thin-slab” composite floor system. Fundamentally, this hybrid system is based on using steel decks and poured concrete acting together to create a long-span floor that requires fewer intermediate supports. As such, it can also mean that the floor-to-floor heights may be able to be reduced since the structure spanning between load-bearing walls or beams is only comprised of the composite slab without the use of additional joists, trusses, or girders. For example, a long-span composite floor system can achieve open bays up to 1,200 square feet, with clear wall-to-wall spans up to 36 feet without support columns. For longer spans, a support column can be thinned to half the size of equivalent reinforced-concrete columns. In some cases, thin-slab construction may mean an additional story can be achieved using a long-span composite floor system compared to a conventional steel or reinforced concrete structure. An added story means more income for a building owner and may improve the overall project financial picture considerably. Thin-slab floor and roof designs also align with LEED v4 because they support a holistic, long-term view of project performance and costs, both to the building owner and to the environment. Of course, there is no single solution for all buildings or even throughout a single building. For example, the most cost-effective and best-performing design solution may be a mix of structural systems, such as a roof made up of a traditional steel joist and deck system, occupied floors constructed from a long-span composite floor system, and outdoor canopies and sun screens made from exposed architectural steel deck. The best way for an architectural and engineering design team to get up-to-date information on capabilities and cost is to work with a steel system supplier in the earliest design stages. By using their assistance, more informed design and budget decisions can be made in the selection of a steel building system that will not only excel in the area of design intent but also holistically take into account a set of related material costs, erection costs, and effects on project timelines. Therefore, getting the right information early on allows design teams to quickly and effectively determine which system or systems make the most sense for any particular project. Optimized floor-to-ceiling spaces and heights are a distinct advantage of a thin-slab, long-span composite floor system used in many modern multifamily buildings. Glazed Brick is available in a range of standard and fully customizable colors, surpassing the ordinary and taking brick to new heights. To create this unique look, a glaze is applied to the outer surface of extruded clay and carefully fired, allowing an unlimited color range and variation of textures, from glass smooth to speckled and rough. The Hager powered by SALTO HS4 platform is a robust and dynamic access control solution that can provide tailored benefits to nearly every type of facility installation at a fraction of the upfront and ongoing costs. Versa-Dek® is a long-span composite floor system that provides steel/concrete composite action to achieve thin-slab, open floor spans up to 28 feet. In addition to a clear span, the system addresses aesthetic, acoustic, and fire rating demands, while minimizing the total project cost and the owner’s building life-cycle cost. Quest’s unitized window products are versatile and can be utilized to form a complex window-wall cladding system. The Quest system is customizable, including vision glass, metal panels, insulated metal panels, and spandrel glazing. Quest products are engineered to meet or exceed current local and federal building code standards. This product is designed to create a uniform, aesthetically consistent open vertical reveal between panel or lap siding. When design and detail excellence work in concert with ease of use and application, then you must have XtremeTrim® on a project.